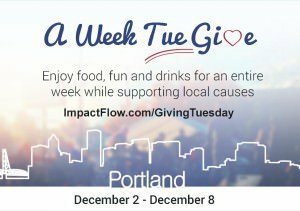 Portland startup ImpactFlow is pleased to announce that it will take part in #GivingTuesday, a national campaign that works to unite the collective powers of a unique blend of partners—charities, families, businesses and individuals—to transform how consumers think about, talk about and participate in the holiday giving season. Taking place December 2, 2014—the Tuesday after Thanksgiving—#GivingTuesday will harness the power of social media to create a national movement around the holidays dedicated to giving, similar to how Black Friday and Cyber Monday have become days that are synonymous with holiday shopping. ImpactFlow, an online marketplace that matches individual donors and companies with nonprofits in their community, has partnered with local Portland businesses including Lardo, Coalition Brewing, Pairings Portland Wine Shop, Rooks Traditional Barbershop, Mutiny Tattoo, Thrive Pacific NW and a host of others to participate in A Week Tue Give. This week­long campaign will empower businesses to sponsor local nonprofits with a percentage of their sales and/or matching donations. A Week Tue Give kicks­off on #GivingTuesday, Dec. 2, 2014.